The turbines from SeaEnergy Renewables have the legs of an oil platform and the head of a wind turbine. In a few years, it claims the idea will be dominant. ABERDEEN, Scotland -- What do you get when you crossbreed an offshore drilling platform with a wind turbine? A cheaper way to get wind power, according to SeaEnergy Renewables. The company – founded last June by a group of oil industry veterans – wants to popularize a somewhat new technique for installing offshore oil turbines that it claims will cut the cost of wind energy and let wind developers place their turbines further out to sea. The company, which will both build and operate the wind farms, hopes to be generate 1 gigawatt of wind energy off the coast of Scotland in five years and be pulling in £500 million in revenue a year. The ultimate goal is to have 3 to 5 gigawatts under its control, said CEO Joel Staadecker in an interview. In a nutshell, the company plans to place large (5.5 megawatt plus) wind turbines on top of jackets – i.e., four-legged stools measuring 61 meters or more in length – rather than the familiar single white monopile common to the wind industry. The jackets were developed in the oil and gas industry. The jacket is placed in the water separately. The turbine is then dragged out to sea by boats and placed on it after the jacket is anchored. "We think the same skill set [building oil platforms] maps to marine energy," he said. 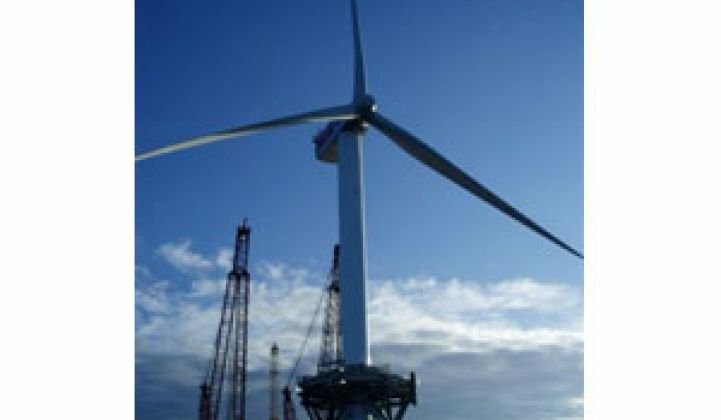 The company next week will find out if it has won one or more bids to acquire leases to develop wind farms in three different locations off of Scotland. 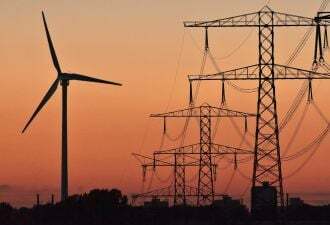 It is also bidding on leases to build wind farms in other parts of the U.K. Those bids will be announced toward the end of the year. Aberdeen is either a logical or unlikely spot for wind energy experiments, depending on your point of view. The city rocketed to prosperity in the 1980s with the exploitation of the U.K.'s North Sea oil reserves just off the coast. At that time, fishing fleets transformed themselves into energy services companies. Although heavily associated with oil (and the flashy money that goes along with oil and gas), the city now hopes to do the same with wind. So think of it as a little bit of Texas in Europe (though without the 10-gallon hats). The E.U. is soon expected to approve the development of a €40 million wind energy test site off the coast of Aberdeen. The jacket technique has already been tried twice to create two 5.5-megawaatt turbines off the coast of Aberdeen. The two turbines provide power to oil rigs in the Beatrice field a few kilometers off the coast. The wind turbines are two and three years old. (We have some video coming of them later.) Those two turbines were built by the Talisman, a large oil company. SeaEnergy bought the rights to and is turning the idea into a company. More than 40 jacket turbines will be installed by the end of next year, he said. The technique has a few advantages, pointed out Allan MacAskill, business development director for SeaEnergy. First, it costs less to build the turbine because the business end of the gigantic device – the gearbox and spinning blades – can be assembled on shore. The less construction you do at sea, the better, he said. One of the chief achievements in this area revolved around figuring out a way to mount the turbine, which sits on a bobbing ship, onto a fixed platform. The problem was solved by inserting hydraulic jacks on the jacket, which can take the mass from the ships when the ships dip with the waves. Once the turbine is on the platform, it is turned until the bolt holes on the turbine base match with the jacket. Second, the four-legged jacket gives the turbine more stability in deep water. The first two jacket-based turbines are in 39 meters of water. Most conventional offshore turbines are confined to areas where the water is closer to 20 meters in depth. Although European voters overwhelmingly want renewable energy, coastal communities often complain about the site of turbines. You can see the two existing Beatrice turbines from the shore, but you have to drive to a particular part of the coast and squint, said MacAskill. And the skies have to be clear. Later turbines will be placed 60 meters out and likely generate 6, 7 or even 10 gigawatts of power. Third, they use less steel and steel is money. The jackets and transition platforms for the two Beatrice wind turbines weigh less than 1,000 tons each, said MacAskill. Conventional offshore turbines of the same size weigh more than 1,000 tons, he claimed. Wind is big here. Scotland boasts that it has 25 percent of Europe's wind resources. In the Orkney Islands north of the mainland, trees only grow in sheltered areas because of the wind: next to a house, a tree will only grow to the roofline. Otherwise, the land only supports grass and short bushes. The U.K. says it wants to get 15 percent of its power from renewables by 2020. Scotland on its own is shooting for 50 percent from renewables by then. The U.K., as a whole, is aiming at generating 25 gigawatts of power from offshore wind by 2020. Currently, Europe's total offshore wind power is close to 1 gigawatt. The offshore wind farms that SeaEnergy is touting, however, may not come online until 2015. Will other companies try the technique? Sure, said MacAskill. Pictures of the two Beatrice turbines are popular staples at alt energy conferences. Several oil services companies will also likely increase their wind portfolios over the next 18 months because the oil industry remains in the dumper. "But the real opportunity for us is the know-how," he said.